Hollywoodbets Sports Blog: Win BIG with Hollywoodbets' Euro 2016 Promotions! 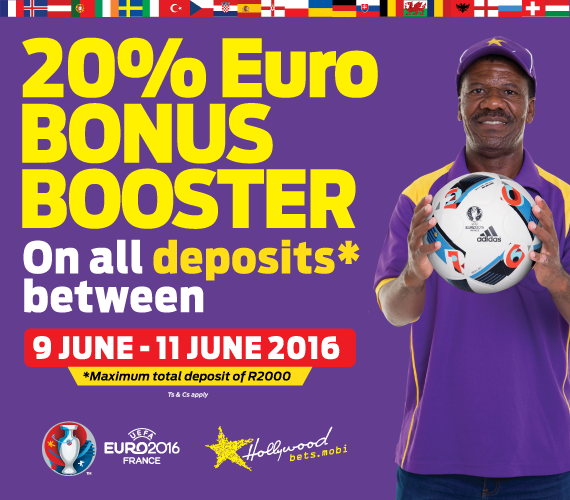 Win BIG with Hollywoodbets' Euro 2016 Promotions! 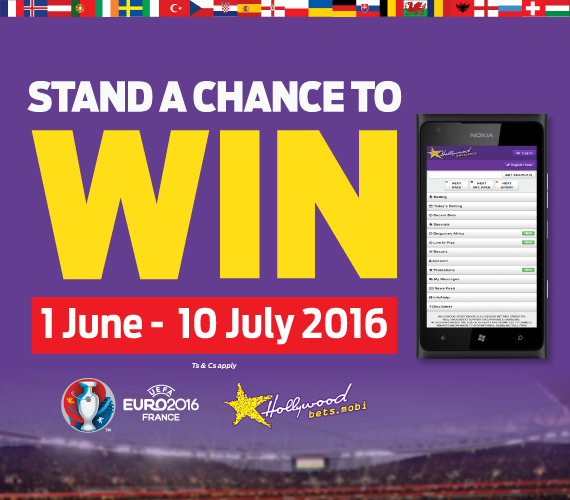 With Euro 2016 just around the corner, Hollywoodbets is offering you the chance to WIN BIG! We're offering three separate promotions all tailored toward maximising your enjoyment of Europe's showpiece football event! 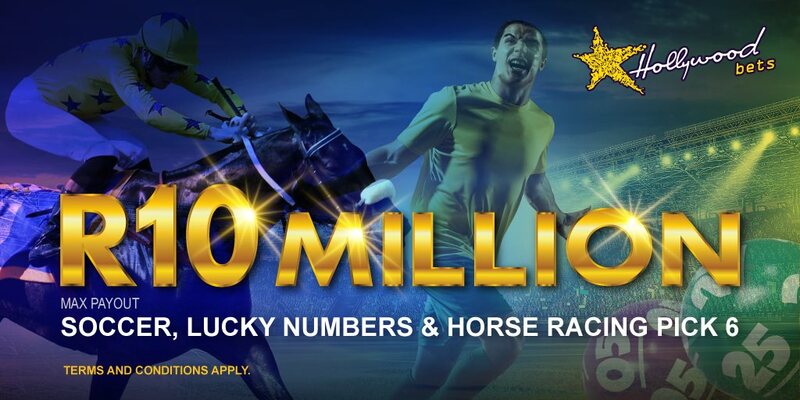 Fancy winning R10 000 cash, a R5000 Hollywoodbets voucher or R2000 airtime? Hollywoodbets has got you covered with our Euro 2016 Mobile Competition. In order to enter, simply spend a total of R200 or more during Euro 2016 on your mobile betting account. Multiples that include matches from the Euros as well as other competitions will be counted. Only bets placed on the contestant’s cellphone betting account via the Mobisite o r feature phone application from 1 June – 10 July will be counted as a valid entry. 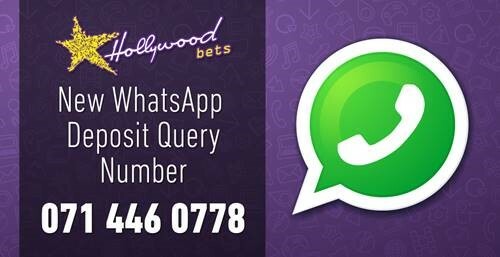 Contact the Hollywoodbets Helpline on 08600 46559 for more information. Click here for terms and conditions. Get more bang for your buck with Hollywoodbets’ 20% Euro Bonus Promotion! From 9 June - 11 June 2016, all Hollywoodbets account holders will receive a 20% bonus on their deposits up to a total sum of R2000. The amount deposited and the subsequent bonus MAY NOT be placed on both markets in the same event – i.e. betting on To Bat First or High/Low Lucky Numbers . The deposit and bonus must also be turned over once at odds of 5/10 (0.5) before any withdrawals can be made. Contact the Hollywoodbets Helpline on 08600 46559 for more information. Click here for terms and conditions. 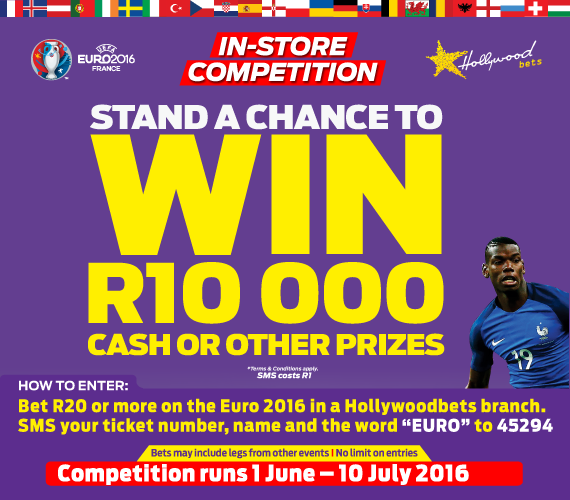 Stand a chance to win R10 000 cash, a R5000 Hollywoodbets voucher or R2000 airtime with Hollywoodbets’ Euro 2016 Retail Competition! To enter, simply play R20 or more on any Euro 2016 market and SMS “EURO”, your name as well as your ticket number between 1 June and 10 July to enter – SMS costs R1. This competition is only valid for cash bets taken at Hollywoodbets’ retail outlets. Multiples that include matches from Euro 2016 as well as other competitions will be counted. Contact the Hollywoodbets Helpline on 08600 46559 for more information. 1. This promotion will run on all deposits made between 9th June 2016 and 11th June 2016. 2. 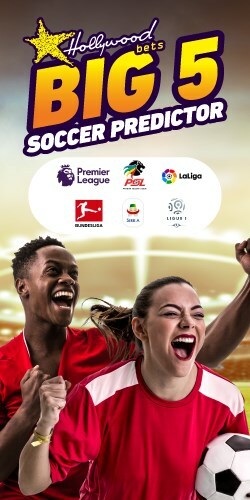 Contestants must be over the age of 18 and have an active Hollywoodbets account in order to participate in the promotion. 3. The promotion is valid for Hollywoodbets account holders only. 4. The bonus is only valid for deposits made up to a total sum of R2 000 per participant. Any sum of deposits made above this amount will only receive the maximum bonus which is R400. 5. 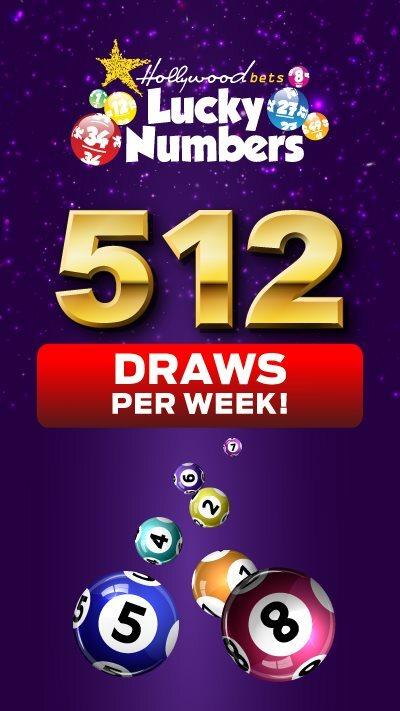 If the participant’s bonus is not credited within 24 hours, the participant must send an email to bonus@hollywoodbets.net, with “bonus promotion” in the subject line, along with their Hollywoodbets account number, the bank or Hollywoodbets branch where the deposit was made and the amount deposited. 6. The amount deposited and bonus credited cannot be wagered on both markets in the same event. 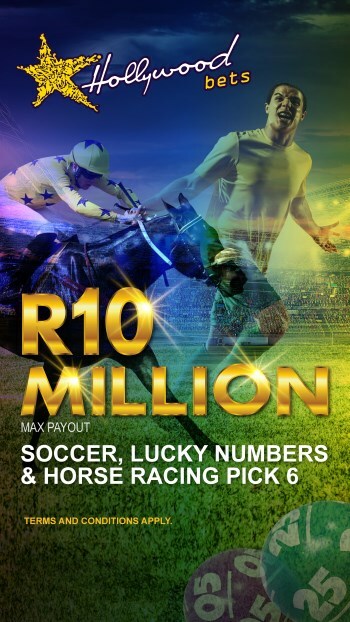 This includes betting on Lucky Numbers (High/Low), To Bat First, To Kick Off First, or any markets related to an event of this sort as deemed by Hollywoodbets in its sole discretion. 7. The amount deposited and the bonus credited must be turned over (staked) once at odds of 5/10 (0.5 decimal) or above. 8. Any participants suspected to be in breach of points 6 and 7 will have their bonus revoked. 9. Hollywoodbets will not be responsible for any losses that are incurred due to point 8. 10. Betting on multiples is permitted subject to the odds of the multiple bet exceeding 5/10 (0.5 decimal). 11. The promotion is intended for recreational purposes and for Hollywoodbets customers only. 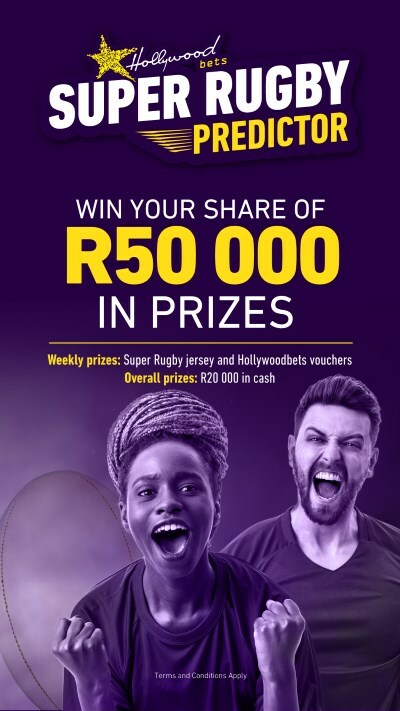 Should a participant be suspected of abusing the spirit of the bonus, Hollywoodbets reserves the right to withdraw any bonus awarded, along with disallowing the participant from participating in future promotions. 12. Syndicate betting is prohibited and participants found to have duplicate accounts or attempting to open duplicate accounts will have their bonuses and resultant winnings removed from all of their accounts. 13. The sum of the deposit and the bonus must be turned over in full before a withdrawal may be made however, a withdrawal of any winnings over and above this stipulated sum is permitted. 14. Individual customers betting patterns may be monitored and Hollywoodbets, in its sole discretion, may revoke any bonus and shall not be responsible for any losses that are incurred by the participant. 15. Hollywoodbets reserves the right to cancel or withdraw this offer or change any of its terms and conditions at any time and without cause or notice. Hollywoodbets also reserves the right to disallow certain account holders the bonus. 16. Hollywoodbets reserves the right to request FICA documentation, for whatever reason, from any customer prior to the account being credited with the promotional bonus. 17. Every Hollywoodbets account holder participating in the promotion shall be deemed to have acknowledged and accepted the rules by virtue of their participation.